Stipes tufted, 5-15 cm long, densely covered when young with yellowish-brown, entire, narrowly linear, hair-pointed scales; stolons long shining sometimes bearing scaly tubers (1-3 cm long), c. s. of stipe with 2 large bundles, one medium sized and one very small bundle; fronds 30-60 cm long, pinnate; rachis grooved, scaly above; pinnae sessile, unegual at base, auricle acute, articulate to rachis, both surfaces glabrescent; lower pinnae obtuse, gradually shortened, upper soriferous pinnae to nearly 4 cm long, more or less acute; margins serrulate to crenate. Sori round, medial to submarginal; indusia reniform, sinus open. I found this fern growing in the trunks of large tree ferns at 1500 m elevation near NANTOU: Chitou Taiwan. I think these fens will grow in other places, not just tree fern trunks. 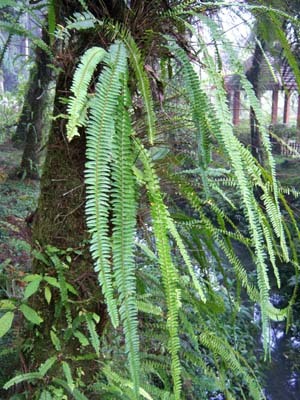 This is a very noticeable fern with its 60 cm long pinnate fronds trailing down off the tree fern trunks. It likes a cool wet environment.